Avoiding the issues when they happen won’t make them go away and can often make the situation worse. If you notice a conflict, encourage those involved to find a way to work it out. If you have issue with a coworker, address it head on privately before the bad feelings multiply. The key word here is talk – not assign blame. Focus on the problem, not your opinion of the other person’s character. Make sure each person has enough time to say when what he or she feels is the issue. Don’t let one person take over or control the conversation. As essential as talking out the issue is giving your complete attention to the other person when it’s their turn. Do not interrupt. It’s a good idea to repeat back in your own words what has been said to confirm that you understand their point. Find a point to agree on. While your conversation will focus on the disagreement at hand, a solution is only possible if you both can find a point of agreement. When talking about the problem, what are examples where you agree with the other person or can see their point of view? Try to find this common ground to focus on. It’s essential for both parties to apologize for any heated words or actions. Those involved also need to forgive the other person – and mean it. Managers: Don’t take sides, ever. 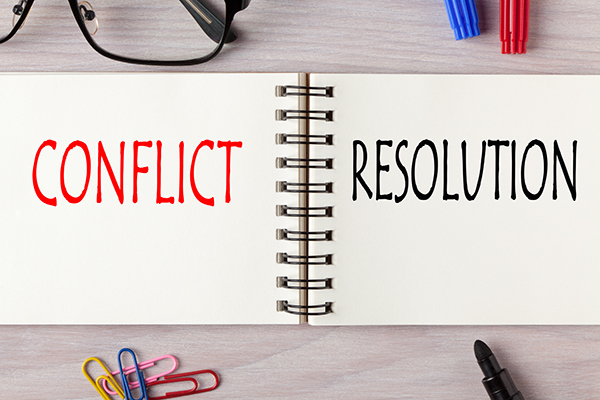 If you’re in a leadership position, you may need to work with the employees involved to help them find resolution and work out their problems. Your role is to help both parties and not take sides.